Almopia (Greek: Αλμωπία), or Enotia, also known in the Middle Ages as Moglena (Greek: Μογλενά, Macedonian: Меглен and Bulgarian: Меглен or Мъглен), is a municipality and a former province (επαρχία) of the Pella regional unit in Macedonia, Greece. The seat of the municipality is the town Aridaia. The municipality has an area of 985.817 km2. Map of the Kingdom of Macedon with Almopia located in the central districts of the kingdom. 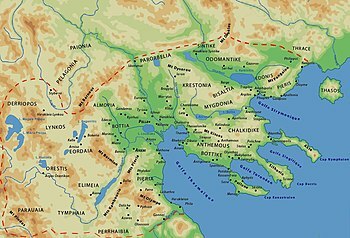 The name Almopia (Ancient Greek: Ἀλμωπία, Almōpia) derives from the Almopes (Ἀλμῶπες), a Paeonian tribe that originally inhabited the area during Antiquity. The Almopes traced their descent to the eponymous mythological figure of Almops, son of Poseidon and Helle. According to Thucidydes, the Almopes were expelled from the region when it was incorporated into the ancient Macedonian kingdom during the reign of Alexander I (r. 498–454 BC). The 2nd-century astronomer and geographer Claudius Ptolemy records three cities in the region in his Geography: Horma (Ὅρμα), Europos (Εὔρωπος) and Apsalos (Ἄψαλος). In the early Byzantine period, the area was renamed to Enotia (Greek: Ενωτία) after a nearby fortress, probably in the vicinity of modern Notia. The name was revived between 1915 and 1927 for the Greek province as well. In the later Middle Ages, the area was known as Moglena (Greek: Μογλενά, Macedonian: Меглен, Bulgarian: Мъглен), from the Slavic word for "fog". Until the early 11th century, Moglena was a province of the First Bulgarian Empire. Captured by the Byzantine emperor Basil II in 1015, it is attested as the seat of a bishopric in 1020, and as capital of its own theme in 1086. The area remained under Byzantine rule until the aftermath of the Fourth Crusade, when it was captured by Tsar Kaloyan of the Second Bulgarian Empire. Moglena was inhabited mainly by Vlachs. They were forced to pass to Islam in the XVIIth century. In Ottoman times, the region was also known by its Turkish name Karacaova or Karadjova ("Black Valley", Greek: Καρατζόβα). 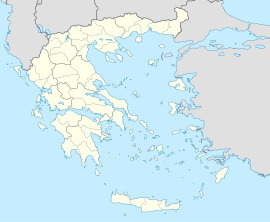 Until the Greco-Turkish War (1919–1922) and the population exchange between Greece and Turkey in 1924,Vlachs and Pomaks inhabited a large part of the regions of Moglena. The province of Almopia (Επαρχία Αλμωπίας) was one of the three provinces of Pella Prefecture. Its territory corresponded with that of the current municipality of Almopia. It was abolished in 2006. ^ Schmitz, Leonhard (1867). "Almops". In William Smith. Dictionary of Greek and Roman Biography and Mythology. 1. Boston: Little, Brown and Company. p. 132. ^ Agni K. Koliadymou (2006). Από την Αξό Καππαδοκίας στο Νομό Πέλλας: Προσφυγικές Διαδρομές (1890-1940) (PDF). Thessaloniki. p. 117. ^ Wolfgang Dahmen; Johannes Kramer (1986). "Das Meglenorumänische". Rumänistik in der Diskussion. Tübingen. p. 262. ISBN 3-87808-859-0. ^ Kazhdan, Alexander (1991). "Moglena". In Kazhdan, Alexander. The Oxford Dictionary of Byzantium. Oxford and New York: Oxford University Press. p. 1389. ISBN 978-0-19-504652-6. Wikimedia Commons has media related to Almopia.